Upcycled wooden pallets have so much garden potential. Here are a few simple tips to help you transform them into budget-friendly furniture. It only takes a few simple tools to create your own pallet furniture. But before getting started put on some gloves and check for splinters, nails or staples that might be sticking out and remove them. Pallet sizes vary from 48 to 36 inches square so you may need do some cutting with a circular saw to build pieces that fit your space. Use a hand drill and screws put the pallets together and add the legs. Lightly sand the wood so it has a smooth, splinter free surface. 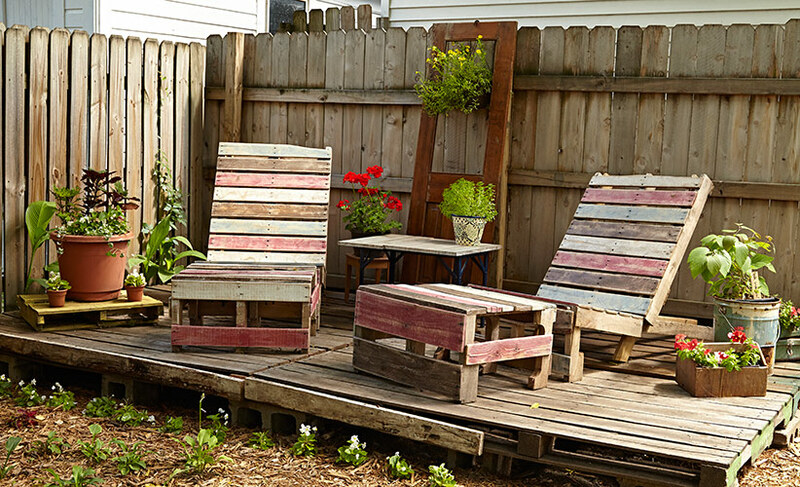 Use stain or paint to give your pallet furniture its one-of-a-kind look that suits your garden perfectly. Now you're ready to invite friends over to sit back, relax and enjoy the view. Add rustic charm to your garden with this upcycled door turned shabby chic garden planter. Want to help support your local pollinators? Check out these great tips for designing a garden that attracts more pollinators. With the right plants and planting technique, you can cut weeding and watering to almost nothing! Learn how to grow a low-maintenance gravel garden here.